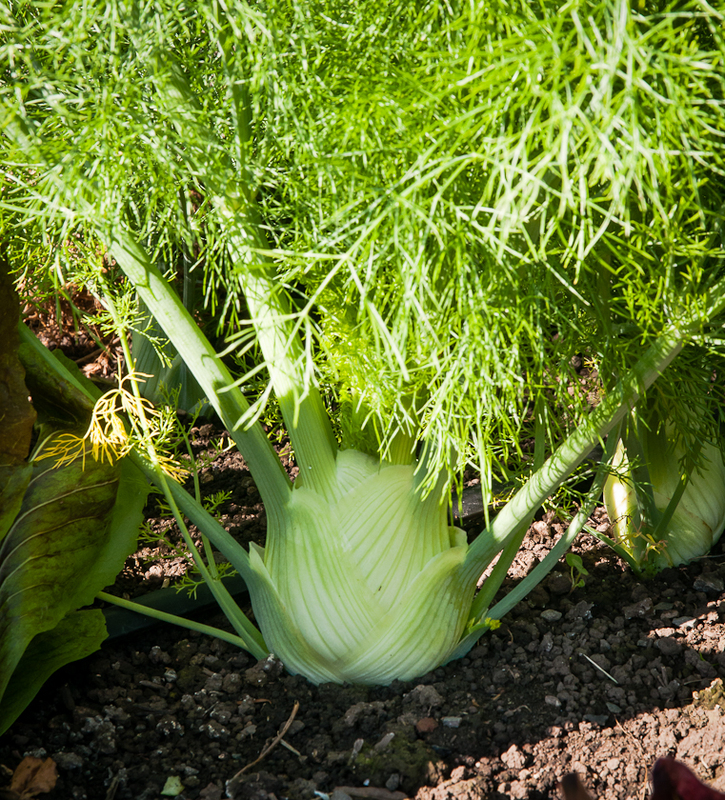 I date the addition of fennel to my kitchen garden to our first travels in Italy in the late nineteen-eighties. At one meal with friends near Venice, we enjoyed a simple green salad garnished with thin, curved anise-flavored slices, crisp like celery but better: raw fennel. And on mixed vegetable platters offered in the city’s restaurants, one of the grilled vegetables looked like a fanned out wedge of onion but its caramelized sweetness had hints of anise and licorice: fennel again or finocchio as the Italians called it. I knew I had to grow this vegetable. My first source for fennel seed was Renee Shepherd’s Shepherd’s Garden Seeds and the variety was Zefa Fino. Later, I found fennel seeds in Territorial Seed’s catalog where Zefa Fino and Perfection were offered. Since then, I’ve grown both varieties. Territorial offers organic seeds of Perfection and Fedco offers seeds of Zefa Fino. They each grow well in my kitchen garden. 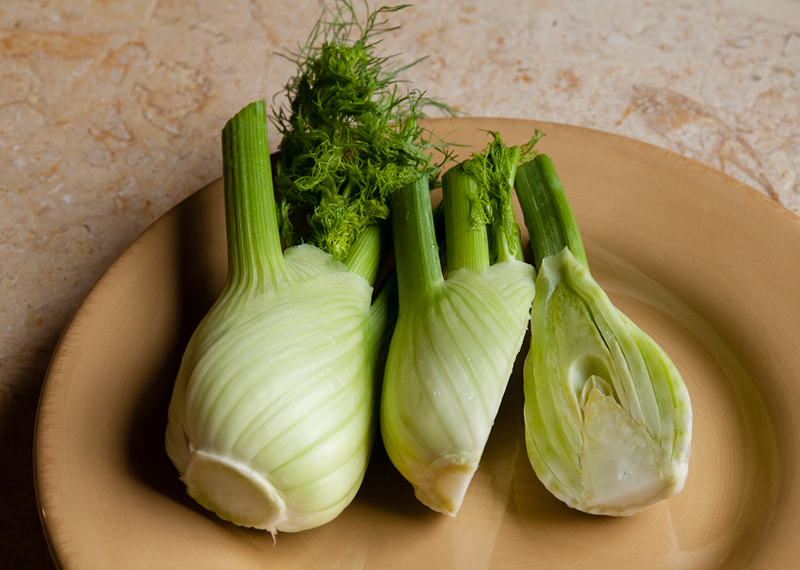 Both varieties are listed as “bulb fennel” to distinguish them from herb fennel grown for seeds. 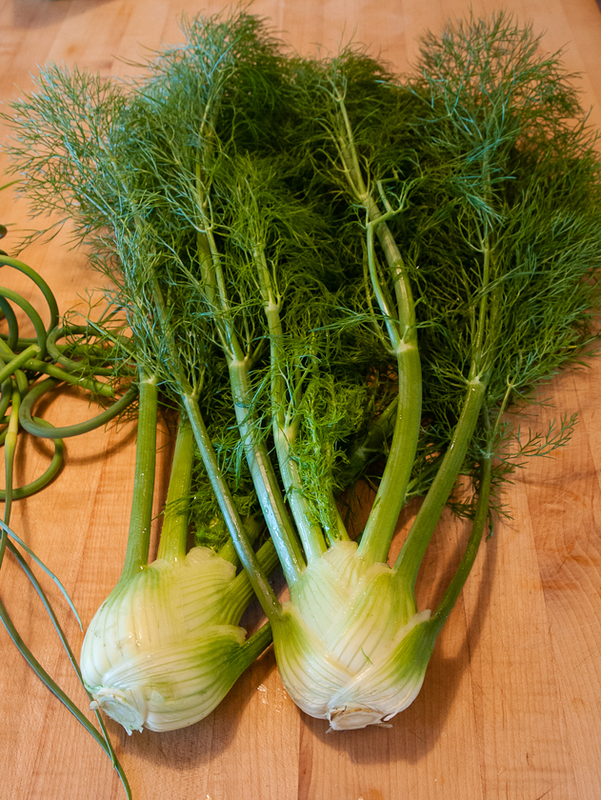 I plant fennel in spring and again in the fall. In the spring, I usually start seeds every few weeks so I’ll have a steady supply starting in mid-June. This year, I started seeds indoors on March first, again on March twenty-sixth and once more on April fourteenth, setting out each group of a dozen or so plants three or four weeks after indoor seeding. On April twenty-second, I planted more fennel seeds, this time outdoors and in mid-July I’ll do a final planting of seeds outdoors to have a good supply for fall. Some garden books advise against starting fennel indoors and transplanting, suggesting that any disruption of the roots will cause the bulbs to bolt early, but in the years that I’ve planted fennel, both indoors and out, I haven’t experienced early bolting. I set out plants or plant seeds eight inches apart in rows a foot apart. Fennel grows best in my garden in cool weather with moist soil, so this year has been a great year for fennel. Even in warmer years, though, keeping the soil moist and mulched has resulted in tasty fennel. In the kitchen, it’s always hard to decide whether to make a raw fennel salad or to grill these beautiful bulbs. If salad is the choice, I often start by making Annie Somerville’s Fennel and Parsley Salad with Meyer Lemon from her inspiring cookbook Everyday Greens. 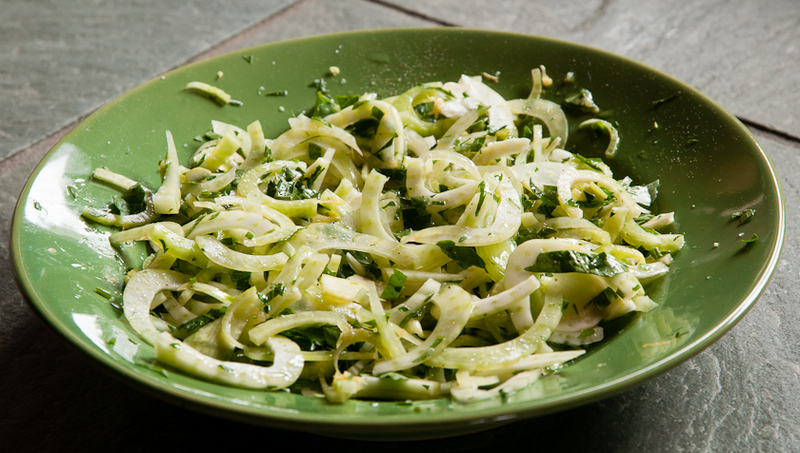 She suggests cutting the fennel bulb in half from top to bottom, thinly slicing it crosswise and then tossing the slices with lots of parsley, lemon zest, salt, pepper and olive oil and finally adding the lemon juice. For one fennel bulb, use half a cup of parsley, a teaspoon of lemon zest, a tablespoon each of olive oil and lemon juice and salt and pepper to taste. Regular lemons or even oranges are fine substitutes for Meyer lemons. This simple salad is wonderful on its own but additions like sliced radishes, grated carrots, roasted beets or spicy greens go well with fennel, as do hard cheeses like Parmesan or Pecorino Romano. 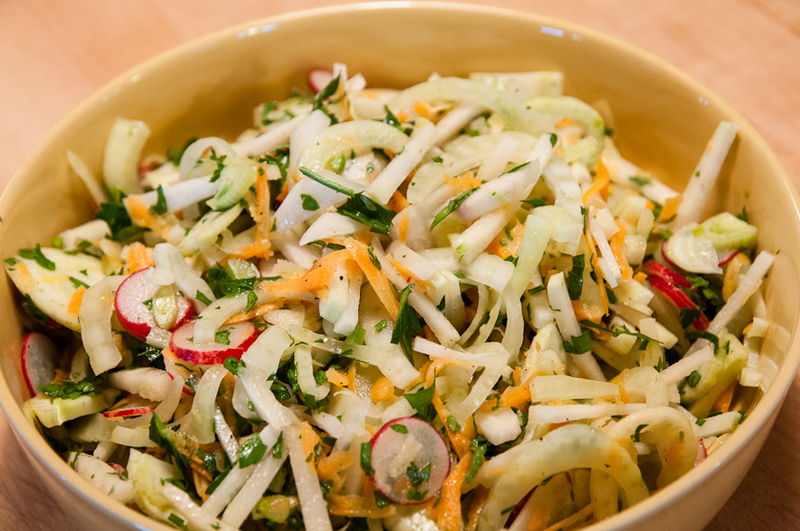 And of course this fennel salad with or without the added vegetables is a wonderful addition to a big bowl of new lettuce. If we are already using the barbecue, I’m tempted to grill the fennel. The flavor changes from the crisp, anise sweetness of the raw bulb to a softer, subtler caramelized anise flavor with a juicy rather than crisp texture. 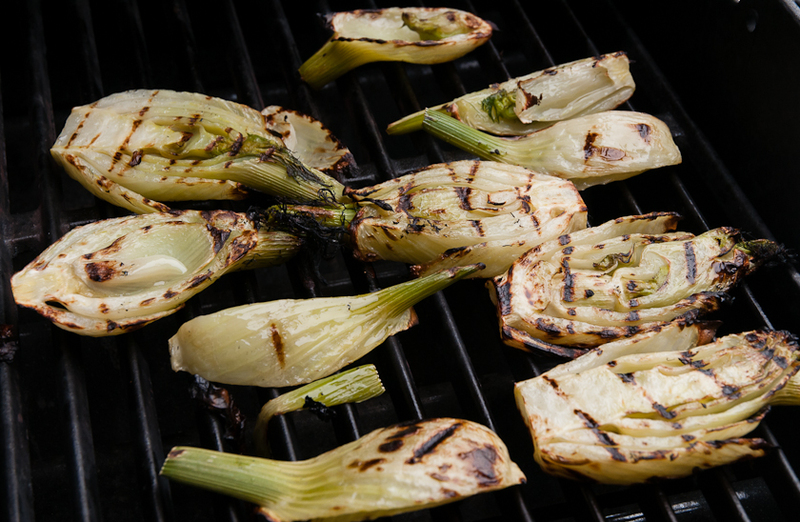 In her Vegetarian Cooking for Everyone, Deborah Madison offers great advice for grilling fennel. She suggests cutting small bulbs in half lengthwise and larger bulbs into half-inch slices or quarters, each piece held together by a bit of root at the base, and then steaming them until they start to become tender, about ten minutes. Once they are lightly steamed, brush them with olive oil, sprinkle on a little salt and grill them for five minutes or so on each side. The steaming keeps the fennel from drying out as it caramelizes on the grill. There are many other ways to prepare this wonderful vegetable, like roasting, sautéing or braising, but simply grilled or sliced raw into salad are my two favorites. The other night, unable to decide between the two, we did both, a perfect way to celebrate the first fennel of the season and to remember Italy. 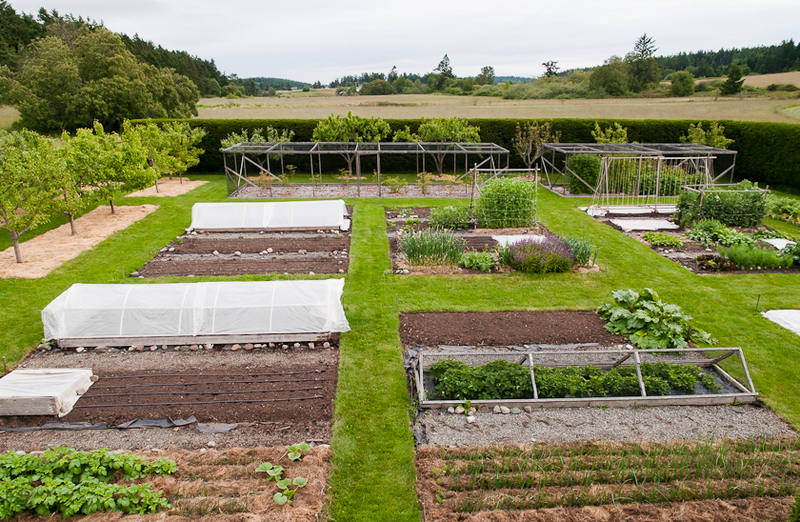 One of the challenges of summer kitchen gardening in the Pacific Northwest is the lack of significant rain from June to September. In New England, where I started gardening, I could count on regular rain all season long. Not here. My first northwest garden was small enough that I could reach most if it with a hose and watering wand once I admitted that it really wasn’t going to rain that week or the next or the next. My next garden was bigger and I soon realized that hand watering simply wasn’t going to work. I needed an irrigation system. It’s taken a while, but thanks to Scott and a series of experiments we finally have an irrigation setup that works almost better than those New England rains did. Our first experiments with irrigation systems relied on soaker hoses, those flexible, black, porous hoses made from recycled rubber. 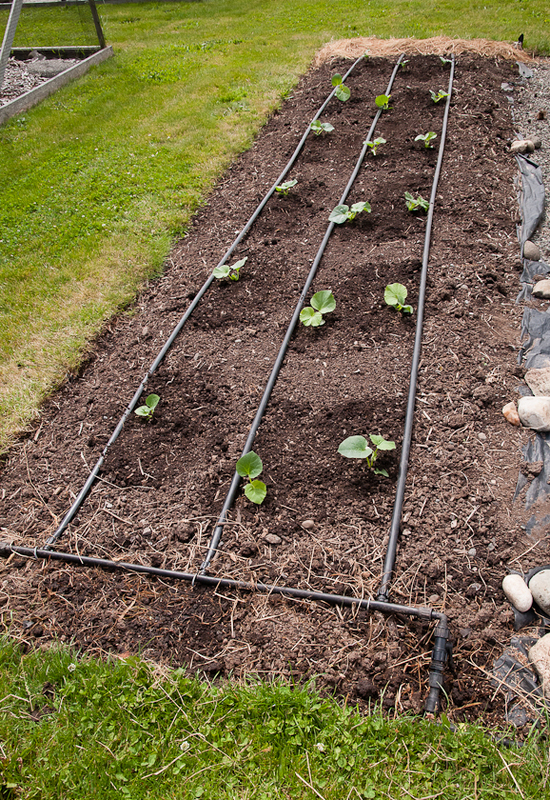 Not only did they provide good irrigation, they were inexpensive and easy to install. After a few years, the tiny holes that let the water leak out did start to clog up a bit and after a few more years, they didn’t leak much at all, but soaker hoses were still available and not too expensive so we just replaced them. They were our irrigation choice for nearly two decades. Several years ago, though, soaker hoses suddenly got harder to find at a reasonable price. At the same time we started thinking that it would be really nice to have an irrigation system that didn’t require quite so much dragging of water hoses to soaker hoses and coupling and uncoupling of hose fittings. A timer that shut off the water automatically would be nice too. And while we were making a wish list, irrigation hoses that lasted longer would be nice and certainly less wasteful. Fortunately for our growing wish list, we found DripWorks and, specifically, T-Tape irrigation. I think it will be our irrigation choice for the next two decades and more. This page from the DripWorks website defines T-Tape and explains how it works: http://www.dripworks.com/category/ttape1. In addition to low cost and ease of installation, T-Tape pleased us because it operates with low water pressure and the water is still distributed evenly along each tape. And a length of T-Tape lasts up to seven years when covered with mulch. We also purchased a simple timer that turns off the water automatically. It is necessary to use a filter at the water source to remove sediment and other particles big enough to clog the T-Tape but it was easy to install the filter. 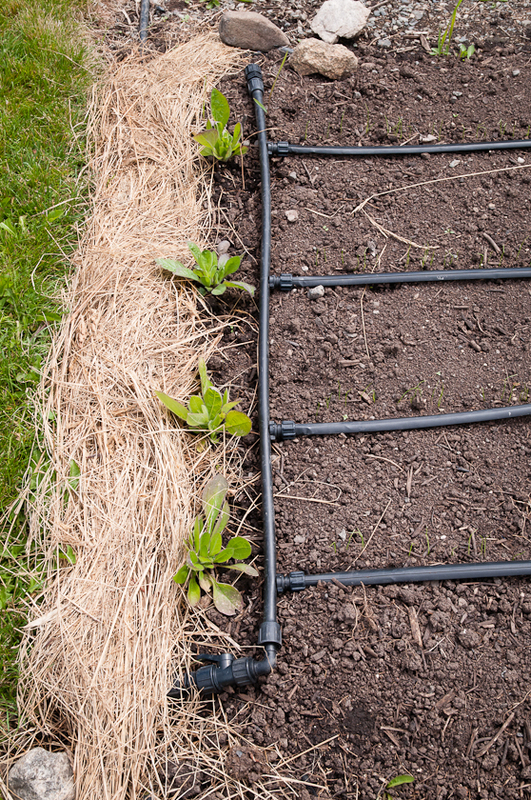 If you are interested in setting up an irrigation system, visit the DripWorks website, http://www.dripworks.com/, which not only lists their products but also provides very useful print material and videos on how to select and install their irrigation systems. And read this guide: http://cdn.dripworks.com/downloads/manuals/DripPlanningGuide.pdf. The company also offers phone consultations on irrigations plans. We drafted a design for our system and then talked with a DripWorks staff person who reviewed our plans and helped with our order. In our plan, we divided our twenty-one five-by-eighteen foot garden beds into three zones of seven beds each. This photo shows nearly all of the three zones. We connected the seven beds in each zone with a supply line, buried just below ground level. At the head of each bed in a zone, there is a tee fitting coming off the supply line and an shut-off valve, and at the end of each of these three supply lines, there is a hose coupler where we attach the water hose. Now instead of dragging a hose to each of the twenty-one beds, we simply drag it to one of the three zones from the centrally located hose bib where we also installed a water filter, flow restrictor and a timer. And within each zone, we can use the shut-off valves at each bed to supply irrigation to the beds that need it and avoid watering beds that don’t. While these supply lines and valves are permanent, we move the T-Tape itself from bed to bed depending on what we’re planting. Each T-Tape unit consists of a short supply line to which we’ve attached two, three or four lengths of T-Tape. The short supply lines attach to the tee fittings at the head of each bed. Our beds typically contain two, three or four rows of plants so we figured out how many units of each size we needed and assembled them. At the end of the growing season, we detach the T-Tape units from the supply valve at each bed, screw a cap to the supply valve to keep bugs and dirt from getting in, fold the T-Tape accordion fashion along the supply line and store it until the next year. From start to finish, it’s a great system. This photo shows the tee fitting coming off the buried supply line, the shut-off valve, the supply line for the bed, and finally, lengths of T-Tape connected with fittings to the supply line. For this bed of bush dry beans, we spaced three T-Tapes eighteen inches apart along the supply line to the bed. In this photo, tiny threads of leeks are starting to grow along the four lengths of T-Tape spaced a foot apart. The photo below shows melon plants I just set out along three lengths of T-Tape. I’ll lay strips of black plastic in the rows between the beds and set a cloche over this bed to provide the warmth it takes to ripen melons. And, of course, the T-Tape will provide the water. There’s been one more unexpected benefit to using T-Tape. The lengths of T-Tape in each bed define the rows and, just as convenient, the emitters along the tape where the water drips out are spaced eight inches apart and work as a surprisingly handy ruler. I space some plants eight inches apart, others sixteen, and others at twenty-four or thirty-two inches. The T-Tape emitters have it laid out for me. That’s something New England rains, welcome as they were, could never do. Mulching is so much more satisfying than weeding. It’s not that I don’t like to weed. 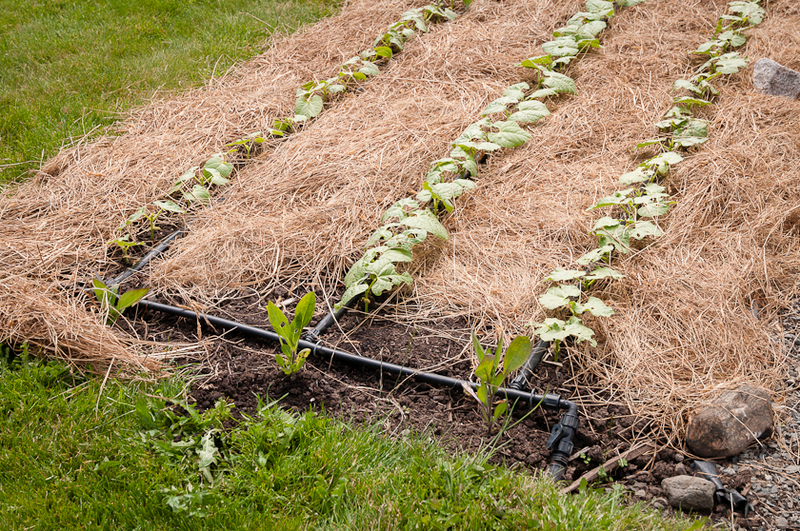 Creating dark, weed-free soil between rows of thriving vegetables has its appeal. But the downsides of weeding are that I need to do it again and again and in the meantime the soil dries out. Mulching, on the other hand, is something I need to do only once and the thick carpet of mulch suppresses weeds, looks just as pretty as freshly tilled soil and conserves moisture. And most satisfying to me, mulched beds signal that the kitchen garden is on its way for another season. I’ve prepared the soil and planted the seeds and now whatever sturdy young plant I’ve just tucked in with mulch can begin its serious growing. 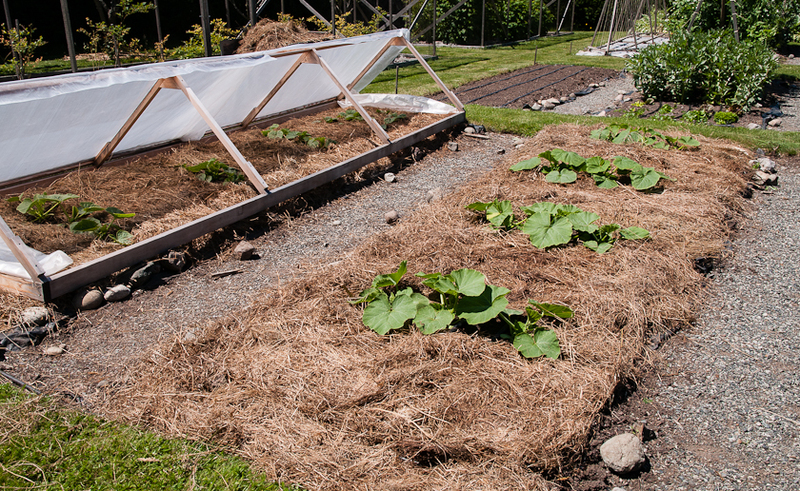 Squash can spread, onions and tubers swell, roots dig deep, peas and beans climb, cornstalks stretch up, all surrounded by a weed-free carpet of mulch. Except for regular irrigation, there’s nothing more to do until harvest time. I mulched for most of an afternoon this week, happy to be covering soil that was still moist from our recent rains. In the past I’ve mulched with wheat or oat straw or lawn clippings that I’d gather while mowing, spread out on a tarp and dry for a day before using. But here on Lopez it’s possible to get a bale of old haylage, one of those big round bales still wrapped in white plastic but no longer good for feed. It’s my favorite mulch, “gardener’s gold” my friend Carol calls it. The best thing about haylage is that the tight plastic wrapping causes the hay to ferment, killing weed seeds. It does smell pretty strongly of rotting silage at first but the odor’s gone in a few days. And a single bale is huge, often lasting me for two years. I just peel off what I need as I need it. I even reuse it, moving it from a spring bed to a summer bed and on to winter beds where I double up layers for cold protection. It breaks down a little but not enough to affect its performance. Eventually, it becomes compost. Over the years, different farmers in my neighborhood have delivered bales to my kitchen garden. One asked only for a batch of chocolate chip cookies in return. 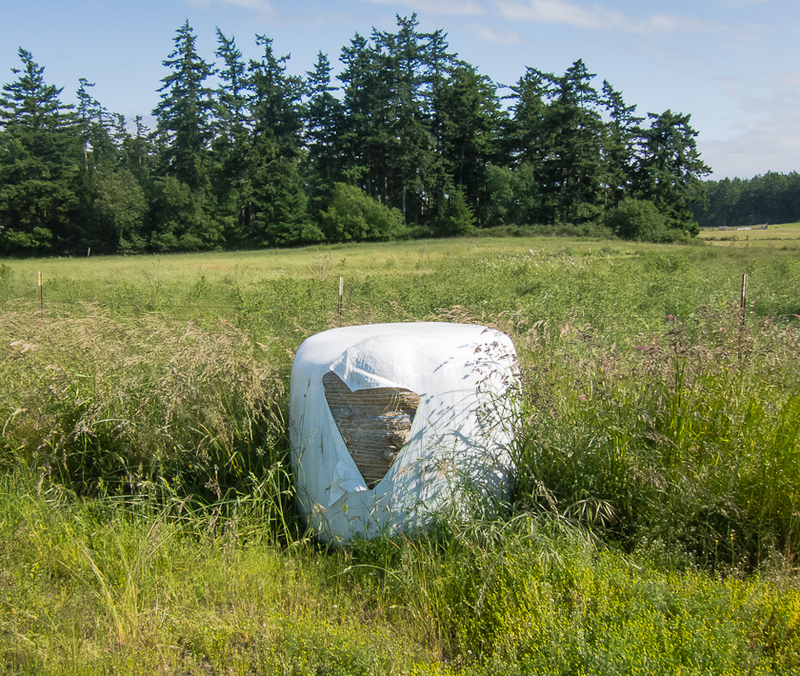 Another, with the precision of the heart surgeon he was before taking up sheep farming, deftly placed the bale exactly where we wanted it and, driving away on his tractor, said he was just glad to get rid of this three-year-old rotting bale. Most recently another kind neighbor has delivered old bales for a small charge. His supply is limited so I’m always happy to get one. It’s an amazing resource. 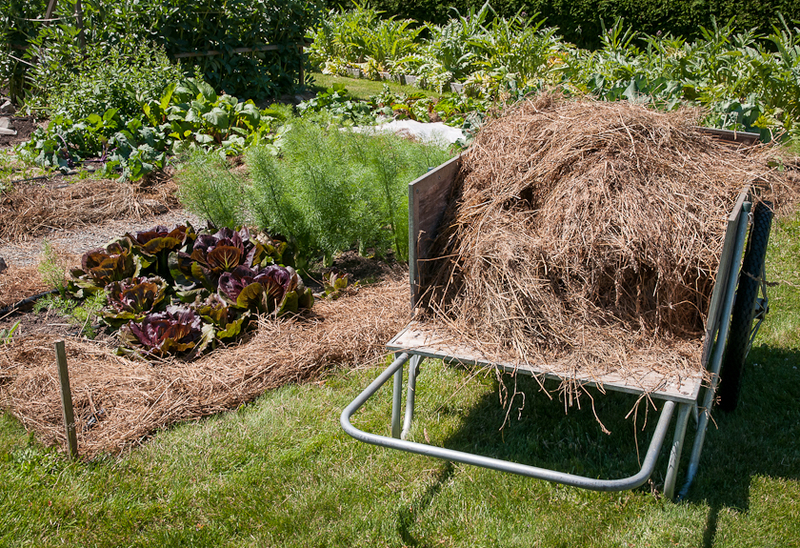 Even if you can’t get your hands on a bale of rotting haylage, give mulching a try. 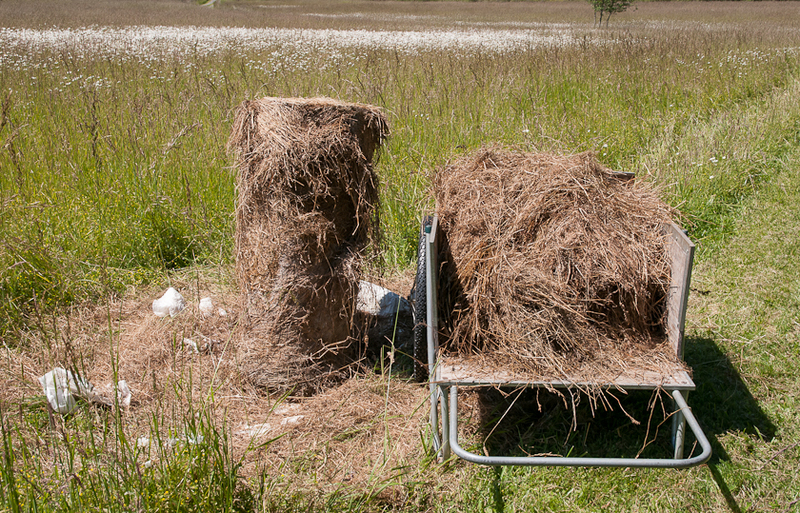 Spreading out straw or grass clippings or old rotten haylage is much more fun than weeding, and think of all the extra time you’ll have this summer! But if you’re really committed to weeding, check out my favorite garden writer Barbara Damrosch’s Thursday column from the Washington Post: http://www.washingtonpost.com/lifestyle/home/how-to-rid-a-garden-of-weeds/2012/06/12/gJQAlPeAaV_story.html She says, “weed early, weed often.” I say mulch once. There are a lot of structures in my kitchen garden, all designed and built by my husband Scott with some small assists by me. They stand out this time of year before vines and foliage fill them and the rest of the garden grows up around them. There are net-covered frames to keep birds out of the blueberries, raspberries and strawberries, plastic-covered cloches to capture heat for tender plants like peppers and eggplant, squash and melons, and trellises to hold up peas and beans. The fruit structures are permanent, the cloches in use year-round are moveable, but the pea and bean structures get reassembled every spring, a ritual that adds welcome height to the garden landscape. 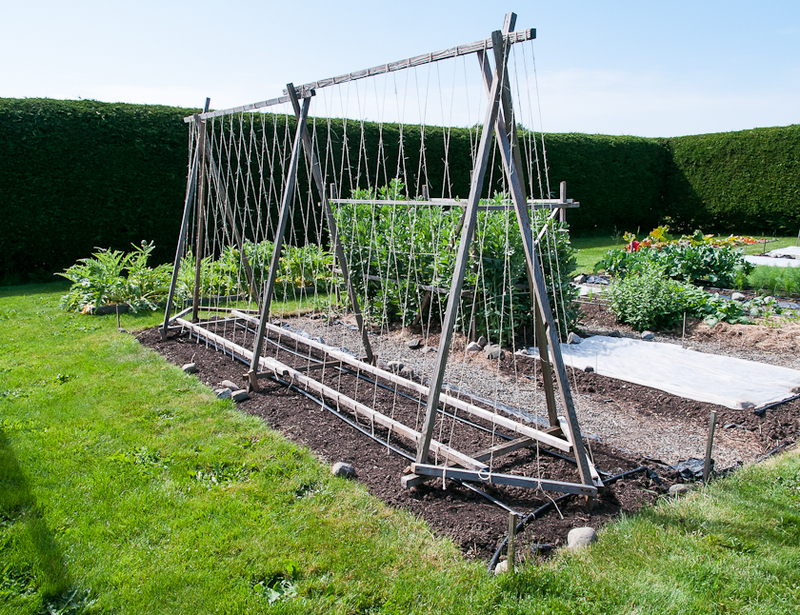 The sugar snap pea trellis goes up in February, then the fava bean “corral” goes up in late April or early May to surround the floppy stalks of fava beans, and then finally there’s the pole bean trellis, the one that takes the longest to assemble but that is the most beautiful. It’s the triangles but even more it’s the strings, creating what looks like a large musical instrument, an Aeolian or wind harp. We assembled the pole bean trellis this past weekend using 2×2 inch 8-foot cedar that we’ve had for nearly twenty years. The wood is getting pretty worn especially the ends that spend the summer in the dirt, but the pieces are good for one more year. Scott connects them with screws so that at the end of the season we can unscrew and store them. “Triangles create stability” is Scott’s mantra and his design is definitely stable, holding up to heavy vines and summer winds. The three main triangles support both the top and the base pieces. At the ends of the trellis, more triangles stabilize the central structure. To anchor the trellis to the ground and keep it from blowing over, Scott pounds stakes at an angle into the ground at the base of each pole and screws the stakes to the poles. When the frame is done, we string the sisal twine from the base pieces to the top, spacing the twine every eight inches, lining it up with the slits in the T-tape irrigation. In the soil beneath this beautiful bean instrument, I plant seeds of beans that will climb up the twine, filling the frame with leaves, then blossoms and finally pods, some for fresh eating but most for shell and dry beans. This year for fresh beans I planted Fortex, Gold of Bacau, Rattlesnake and Northeaster and for shell and dry I planted Good Mother Stallard, Aunt Jean’s Pole Bean, Soissons Verte, Pole Cannelini, Golden Lima and Bonds Orcas Lima. I’m hoping for warm weather for good seed germination and a long, warm summer for maturing beans, but right now I’m simply admiring this beautiful structure that graces our garden each spring.